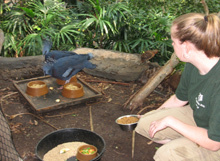 The Minnesota Zoo’s Birds Department is responsible for the daily management and care of all of the Zoo’s exhibit birds. This collection includes approximately 300 birds representing 66 species. Most of the Zoo’s birds are on exhibit in the three-acre indoor Tropics Trail. The Birds Department also manages the Zoo’s collection of African penguins, exhibited in the 3M Penguins of the African Coast display. Interns learn how to maintain and enrich bird exhibits, support and monitor the health of the bird species in the Minnesota Zoo’s collections, and interpret these collections for visitors through demonstrations and presentations. All interns complete an individual project developed in consultation with Zoo aquarist staff. Eight hours scheduled between 6:00 a.m. and 3:00 p.m.